Hainsworth Smart Cloth is the next upgrade on quality from the Club cloth, and it truly is a performance cloth. It is extremely Durable and Hardwearing, and this cloth choice comes in a large variety of colours as opposed to the club cloth standard 4 Cloth Colours. This cloth has an even Smoother Napped finish to the Club cloth and offers excellent cue ball speed and Ball Control. If you are serious about your game and want a cloth that will deliver, then this truly is the cloth for you. It is an all round winner and considering that this cloth does cost around £40 more than club cloth it is definitely worth it in the long run, as you will be left with a hardwearing Cloth that will maintain it’s Smooth finish and with it’s proven resistance to fading leave you with a cloth that will remain Colourful. 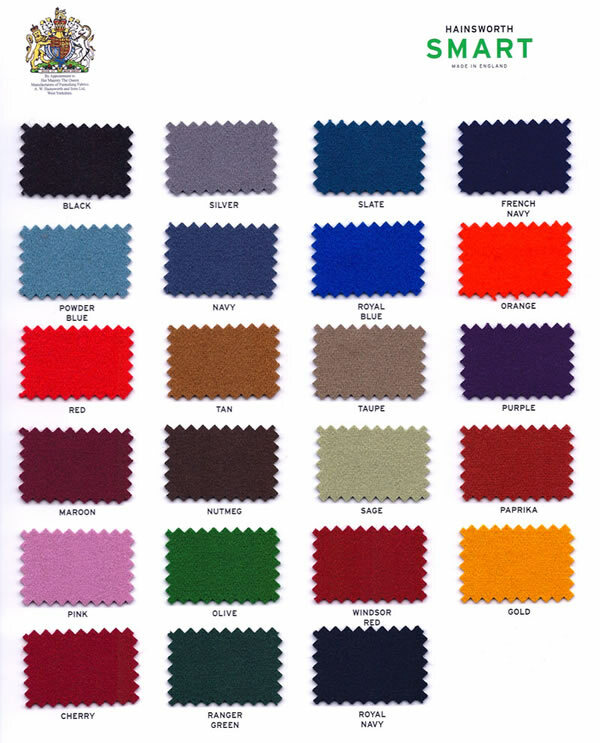 Colours available are:- Black, Silver, Slate, French Navy, Powder Blue, Navy, Royal Blue, Orange, Red, Tan, Taupe, Purple, Maroon, Nutmeg, Sage, Paprika, Pink, Olive, Windsor Red, Gold, Cherry, Ranger Green, Royal Navy.